John Baichtal from make did an excellent job of describing the project. It’s really gratifying to see open-source hardware getting traction. We founded our Hacker Space in 2007. We settled on a mixed industrial space and got some members. The first thing we realized was that the Schlage keylocks on the doors were a pain. We wanted to have flexible access hours, special keys that only worked on certain days, and the ability to monitor who was there and audit things. Looking at commercial systems, there were basically two lines – high quality enterprise systems that average $3K+ per door installed, and cheap house-brand stuff sold by various Asian vendors, usually running proprietary Windows software. None of it was open-source, hackable or terribly flexible until you got into a lot of money in software and services. This is w here Open Access was born. After learning about RFID protocols, wathcing some Defcon and LayerOne talks about the security issues we’d be dealing with, and consulting a couple of experts we settled on a design an built a prototype. Other coworking spaces and hacker groups soon started bugging us for the code, so we put it online. Then they started bugging us for hardware, so I started a hardware business to supply it. We also built out a Wiki to accumulate all of this tribal knowledge. We are now on our 4th revision, and the first one that is not hand-built at our space. I contracted a local PCB assembly shop in Yorba Linda, CA and they were willing to work with our initial low-volume orders. I also found an excellent California-based PCB house to fabricate the boards. The new v4 systems are actually made right here in SoCal! While I had a very positive experience visiting Shenzhen last year, I really wanted to see if I could do this locally. Following the advice of my assembly shop, I made some changes to reduce the amount of hand-work required and take advantage of automation. This is the result. We feel the new generation of hardware offers the best of both worlds – open-source, hackable software and enterprise-grade hardware design. 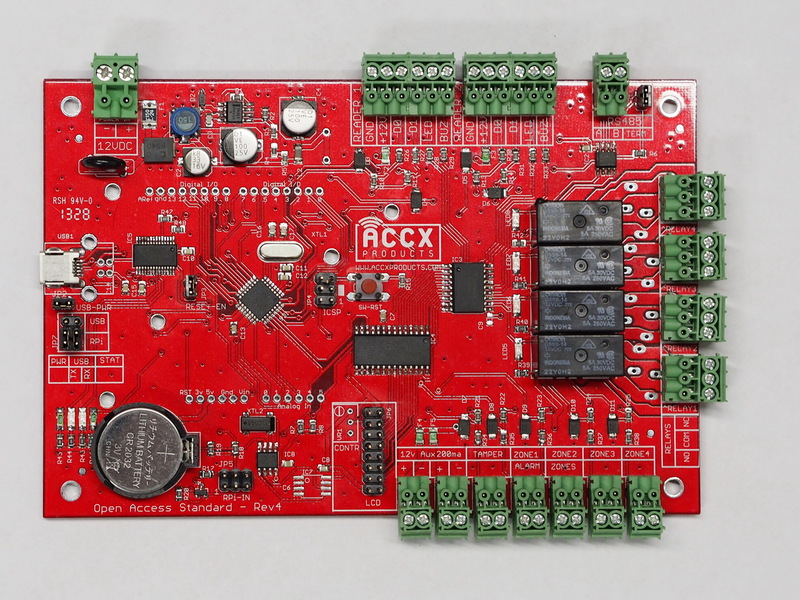 The version 4 features an on-board Arduino-compatible micro, 4xrelays to command wired door hardware, 5alarm monitoring zones, a real-time clock to make logging and time-based access decisions possible, and optional Raspberry Pi bolt-on support. 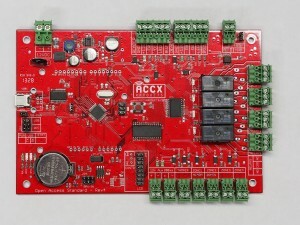 This platform is also excellent for “general purpose automation” applications, as its basically a hardened Arduino. Thanks to all that have contributed so far! Copyright 2011 John Norman and ACCX Products. All rights reserved. .